The Player from Sikkim and Darjeeling who went to participate in the 6th Tirak International Taekwondo Championship which was 23rd 0ct at St.Powal ll Sports Centre, Assumption University Suvarnabhumi Campus, Bangkok, Thailand has come with flying color.The joint team of GTA and Sikkim has won 4 gold 5 silver 8 bronze medals in this Championship. Trilok Subba (7th Dan ) won 1 gold medal in Master Individual Poomsae event, 1 Gold medal in Pairs Poomsae and 1 Silver medal in Team poomsae. Anu Subba ( Blue 1 Belt) won 1 Gold medal in pairs Poomsae. Nilayam Samang Convent ( 1st Poom) of Loreto Convent Darjeeling won 1 bronze medal in 46 kg cadet girls Kyorugi and 1 bronze medal in cadet girl team event. Meanwhile Adwati Subba (1st poom ) of St.Joseph's Convent won 1 Bronze medal in Cadet Team poomsae. Ugen Gurung ( 3 rd Dan ) won 1 gold medal in 1st senior individual poomsae and 1 silver medal in Men's team poomsae. Lalit Portel ( 1st Dan ) won 1 Silver Medal in Senior team poomsae and 1 bronze medal in 1st senior individual event. Priyadarsani Jyoti Baniya of TNA Gangtok (1 st poom ) won 1 Silver in cadet individual and 1 bronze medal in cadet team girls Poomsae event. 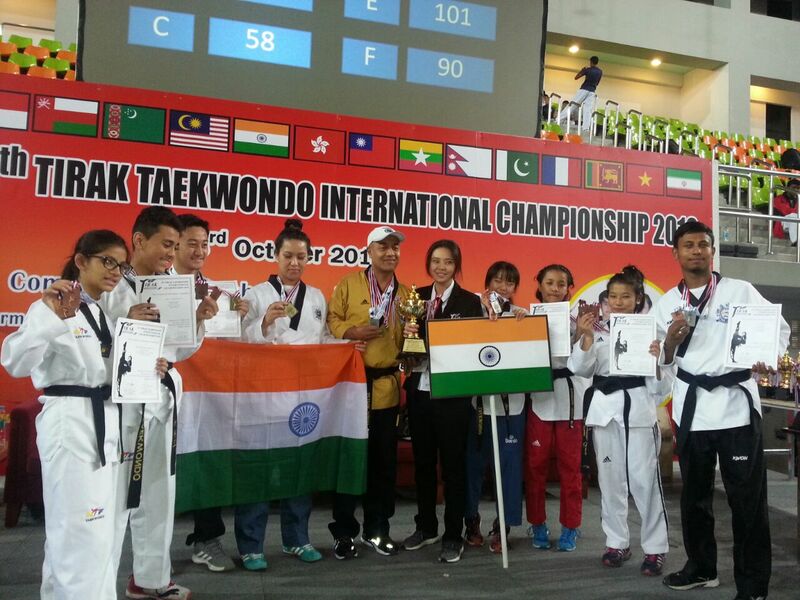 Nugnandini Chhetri of TNA won 1 bronze in individual cadets and 1 bronze medal in cadet team poomsae event. Lalit Portel (1 st Dan ) of Rumtek won 1 Silver in Team poomsae ad I bronze in 1st.senior individual poomsae. Jigdal Jangpo Bhutia (1st poom) of TNA won 1 bronze in cadet individual and 1 bronze medal in pairs Poomsae event. Subba said “ I am satisfied with the result of our team as we had very hard practice even in Dushera Holiday at my own JDSM Taekwondo Dojang at 12 mile Kalimpong .Total 700 parents from countries like Malaysia, Indonesia, Vietnam, Myanmar, Nepal, Srilanka, Oman, Turkmenistan, Pakistan, Chinese Tapai , Iran , Thailand ,India etc. participated in the said championship. 0 Respones to "Joint Taekwondo team score big at Thailand"